Returning to these shores for the first time since appearing on RTE's Other Voices and supporting The National in The O2, the wonderful This Is The Kit bring their alt-folk flavours to Coughlan's of Douglas Street, IMRO's national music venue of the year for a very festive session. This Is The Kit is Kate Stables playing banjo, guitar and a voice of unaffected clarity accompanied by her Wild Band creating primal and electric textures onto songs of unpretentious beauty. Their 2008 album Krülle Bol, was produced by legendary English songwriter and composer John Parish (who has also worked previously with Eels, Tracy Chapman and Sparklehorse) whilst 2010's Wriggle Out The Restless featured members of Francois & The Atlas Mountains, The Liftmen and Get The Blessing to name but a few resulting in high profile support slots for internationally acclaimed heavyweights such as The National, Jeffrey Lewis, José González and more. Continuing The National link, Aaron Dessner is currently working with the band to produce the follow-up album to Wriggle Out the Restless, now being reissued by Aaron’s label Brassland. “The aim is to have fun playing with people whose work I really like,” says Kate in her simple and direct fashion. “The more you exchange and share with people the better things get and the more you learn.” This is the Kit has or will be opening for artists such as Jose Gonzales, Jeffrey Lewis, The National, Alexi Murdoch, Iron & Wine and Jolie Holland, and was recently selected by Sharon Van Etten as her “Favourite New Artist” in an interview with Pitchfork. "absolutely gorgeous, like an aural bath with the warm water lapping over you"
"This is an album which hangs in the balance as expertly as an autumn leaf just before it drops for the barrenness of winter." 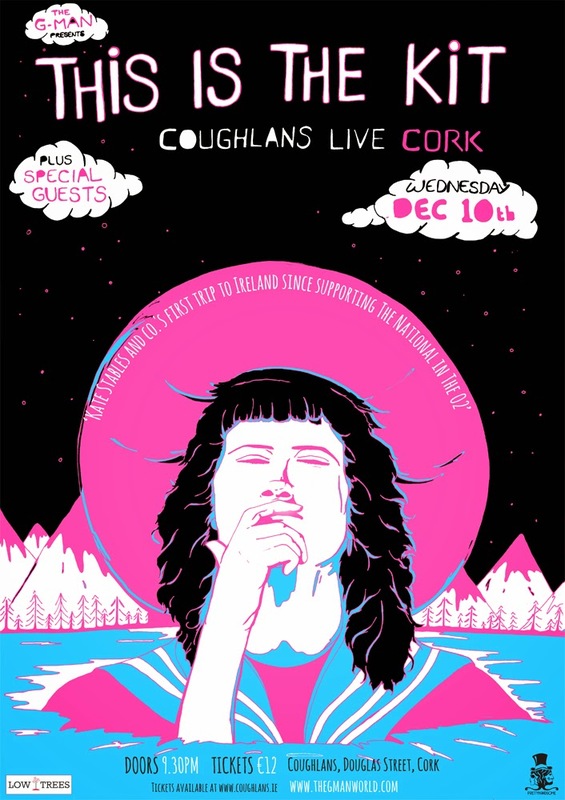 "Favourite New Artist: This Is the Kit"
- This Is The Kit Coughlan's, Cork Wednesday, 10th December. - Entry is €12 with doors at 9.30pm.